I found this lovely free pattern while browsing ConnieLene Knits! I like the classic yet contemporary style of this jacket. It can suit a variety of styles and looks. I can see it on anyone from me to my mom or perhaps it can even be unisex depending on the look. Versatile! ConnieLene was nice enough to share some more detailed photos (as seen in this post) of her completed jacket and some history about the piece! It was included in an exhibition in Auckland, NZ, 2007. Her design and the full pattern can be found below! I like the pattern itself because it is knitted all in one piece, from the left cuff to the right cuff. So there’s only 2 seams to stitch together! It’s a great “stash buster” too since you can use up some lovely yarn from your yarn stash that may not be enough for a whole project but may be great for a few rows in this project! Choose as many or as little color/yarn variations as you like. It’s up to you! FUN FACT: During the exhibition ConnieLene, who is based in New Zealand, met Nicky Epstein as well as one of the world’s fastest knitters, Miriam Tegels! Here’s her funny post all about it. Also, see video of Miriam, the 2006 Guinness World Record Holder for Fastest Knitter, knitting in action in my Need for Speed posting! Worsted Weight/Medium Weight Category 4 yarn in 6 Colors. The full pattern is available for free from Connielene Knits. It is also available in [pdf]. *Follow colour change sequence at the same time inc 1 st each side from Row 20 from cast on. Join side & sleeve seams. 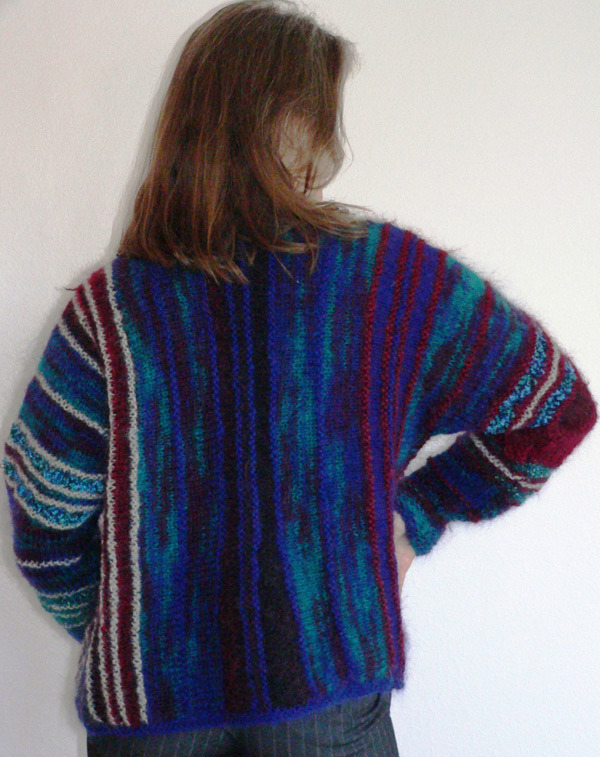 With right side facing join yarn Col 6 at lower left side seam, 1 ch, work dc (USA – single crochet) around the jacket edge. Work 3 dc at each corner. Sew or weave in all ends using wool needle. Notice the piece uses both Stockinette Stitch and Garter Stitch to give it a nice subtle texture. You can see rows of Garter Stitch going through the rows of Stocking Stitch. The instructions suggest choosing a combination of mohair (which can be variegated, and/or solid colors), as well as textured yarns. All yarns must knit to the same tension. The jacket can be created with many or as few colours as you wish or try Stocking Stitch in a variegated with the Garter Stitch stripes in a solid colour. Choose a solid which is not in the variegated yarn but tones or contrasts. The yarns used are 12 ply or triple knit weight that knit up at 12st / 19 rows for 10cm. 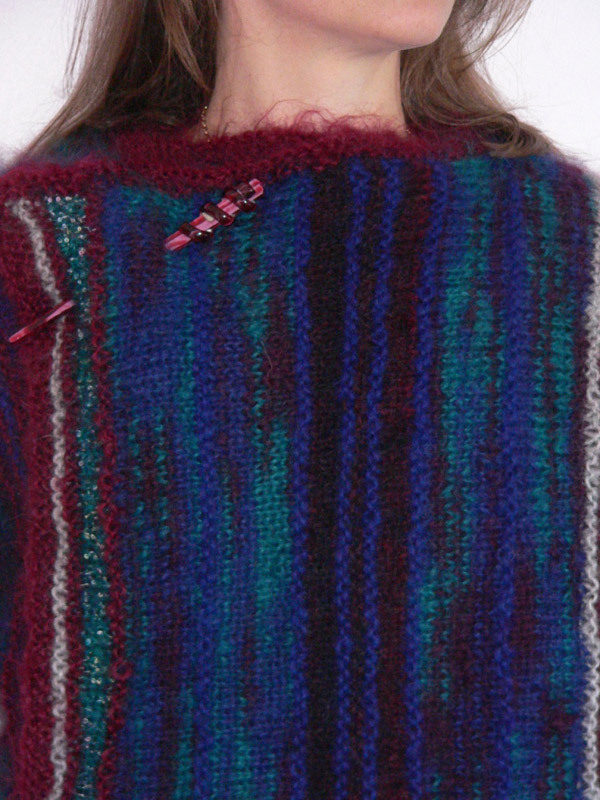 In her example she used 6 different colours, mainly mohair but all yarns that knitted up at 12 st / 19 rows for 10cm. In the U.S., 12-Ply or Triple Knit is the same as our Worsted Weight/Medium Weight Category 4 yarn. Needles – You will not be doing Circular Knitting in this project but I would choose Circular Needles in the longest length possible. The rows may get very long so a nice long set of Circular Knitting Needles in 29″, 32″, or 40″ might help! Stitch Holders – I don’t own stitch holders. But I have a myriad of circular needles. Use a pair of spare circular needles (in a smaller size like 5.00mm or below) to double as stitch holders! Just use needle stoppers or wrap rubberbands around the ends to stop the stitches from slipping off. Etsy or Regretsy? Not So Handmade Markets!